© Copyright 2014 - Opak Media. 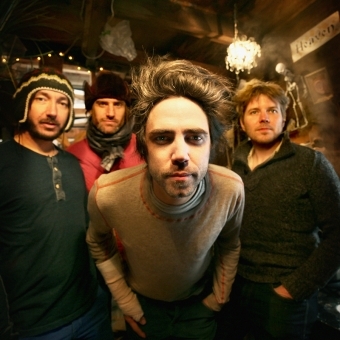 Now approaching their first decade as a band, it really has been an interesting journey for Patrick Watson and his cohorts. Having already played to over 100,000 people at the 2009 Montreal Jazz Festival, performed in front of a full orchestra in 2011 in Amsterdam and again in Watson’s hometown of Montreal in 2013, and most recently performing two songs in Wim Wenders’s current 3D epic “Every Thing Will Be Fine”, what’s next? Releasing their most solid record yet, Watson and his band insist they have only just begun. Still standing proudly at the helm, Love Songs For Robots marks Patrick Watson’s 5th release since Watson first galvanized this “temporary project” in 2006 with the release of his critically acclaimed debut “Close To Paradise”. This calling card release would loudly announce his initial presence going on to sell well over 100,000 units. His latest installment in his already impressive body of work follows up on his utterly stunning 2012 release “Adventures In Your Own Backyard”. Signatures like his hushed falsetto croon remains to be the vessel that transports his vast emotional depths, but Love Songs For Robots proudly shows Watson sailing out into uncharted waters once again. From the crawling crescendo of the opening ethereal soundscape of the title track that heralds the beginning of the album, the listener is slowly lured into Watson’s world that reveals musical moments that are as equally challenging as they are comforting. Destinations are cleverly concealed as we are invited to just take in the lush scenery that includes sharp experimental and progressive left turns, grandiose gestures that shoulder up against fearless austerity – and all delivered in a crisp panoramic scope that could only come from Watson’s lens. His hard fought lyrical pearls are now guided through new found psychedelic and soul swagger influences as left of center instrumentation and arrangements covers up well beaten tracks and makes this a rewarding and truly original statement. Without a doubt Love Songs for Robots bears Watson’s indelible stamp and manages to create a piece of work that is not only stirring, daring, and deeply personal, but also represents his creative watermark so far. It’s all too rare to see an artist wear their heart on their sleeve while never growing weary of the battle against cynicism and callousness, but Watson and band’s aim remains true.